I got myself a new Canon 6D MK II for a very fair price which after 9 years of usage replaces my Canon 5D MK II. With the new camera there was again the question about a L-Bracket. 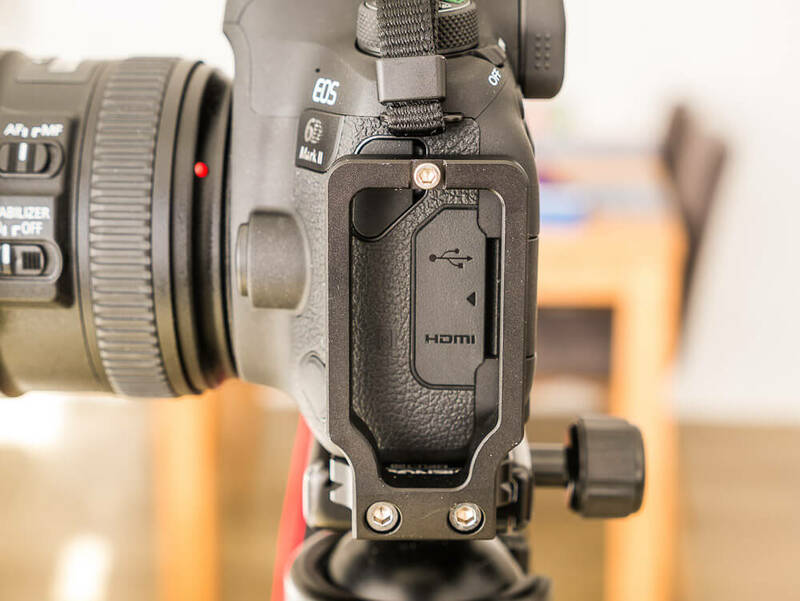 Such a L-Bracket is a very usefiul piece of equipment because it enables a fast switch from landscape to portrait mode and vice versa when the camera is mounted on a tripod. 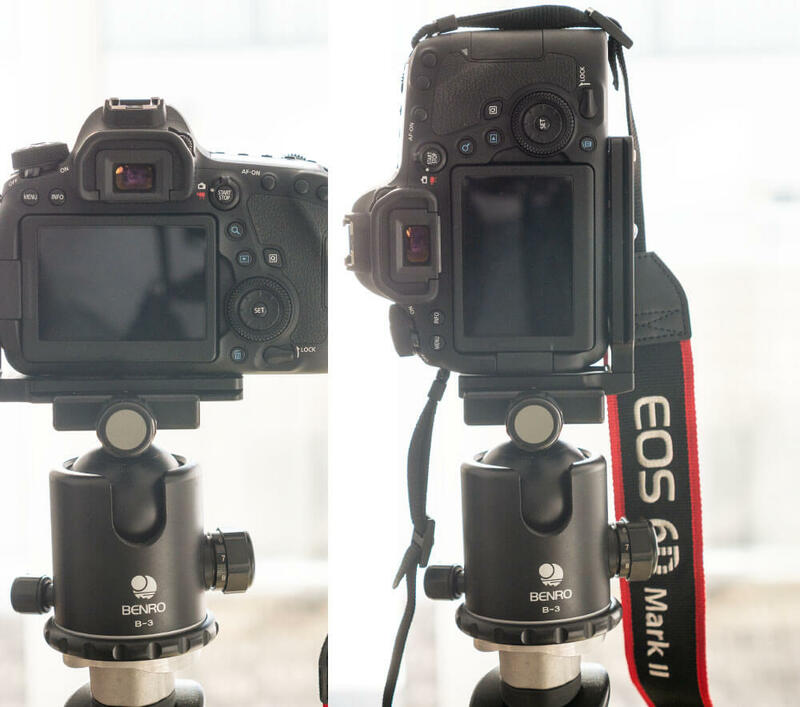 Even more important, in particular with a leight weight travel tripod is the fact that the camera stays in the balance point and doesn’t switch to one side if you bring a ball head into this position. With the new camera my Kirk L-Bracket wouldn’t fit. Those L-Bracktes which are optimized for one camera model are pretty expensive. It is very convinient if you can reach all connectors even with a mounted L-Bracket. 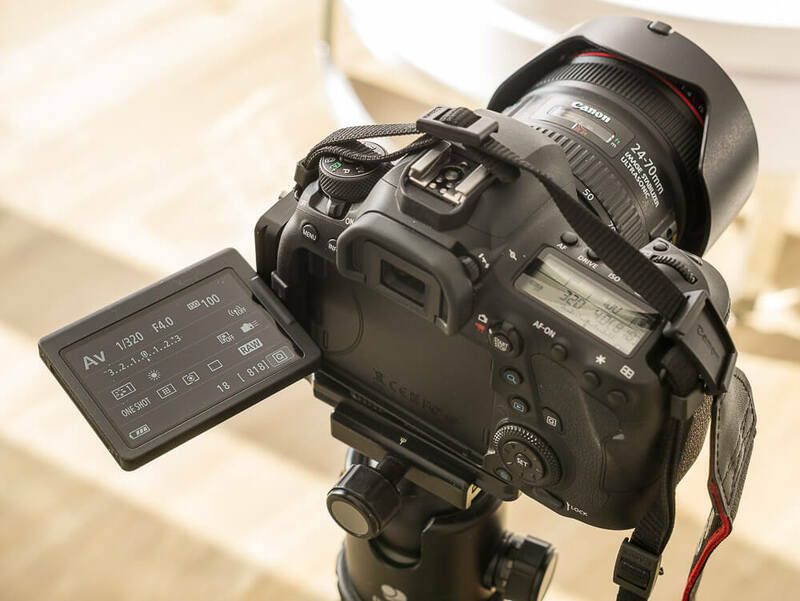 The Canon 6D MK II only has connecors for a microfon, USB and HDMI on the side. The connector for the remote control is on the front side of the camera. 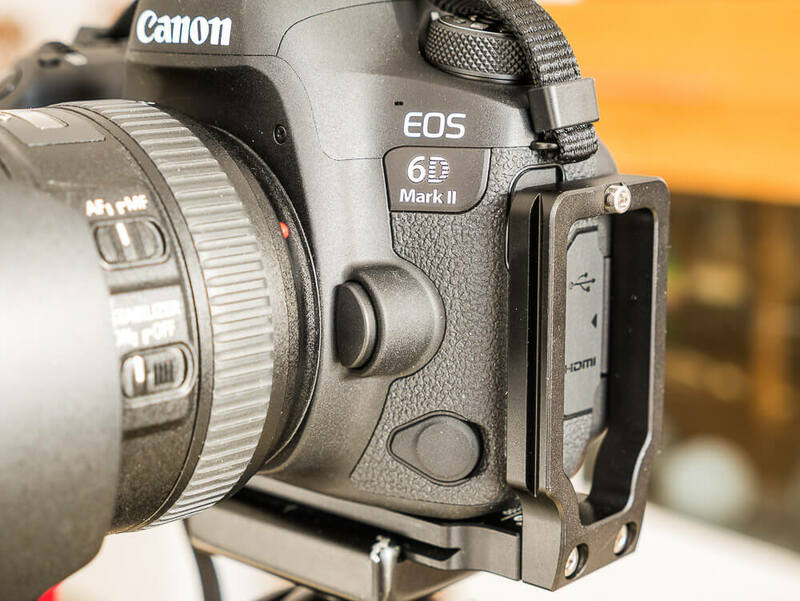 Even though i appreciate the video capabilities of the Canon 6D MK II i don’t use the camera for video capturing and of course you wouldn’t capture video in portrait mode 😉 Since the connector for the remote control is on the front side and the camera can be controled with an app via Wi-Fi my thought was try a universal L-Bracket again. 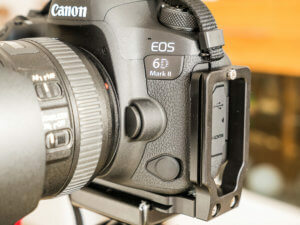 I already had such a universal L-Bracket for my Canon 7D. Since i used DSLRControler for timelpase and the JJC remote control not being able to use the connectors was an issue. With the Mengs MPU-100 L-Bracket there are some limitations about the connectors.So for example the connector for an external microfon is not usable. Timelapse captures could be done with the JJC remote control but even this is not necessary, because the Canon 6D MK II has a intervall timer on board. And for stacking images i can use DSLRController via Wi-Fi, so the universal L-Bracket is usable, even though not all connections are reachable when the the bracket is mounted. But there is a limitation when the Mengs L-Bracket is mounted. The display cannot be moved all the way because the joint of the display is covered partially by the bracket. This way the display be pointed to the front of the camera and use it for Youtube videos, where you film yourself. Allerdings gibt es eine Einschränkug. Wird der Mengs L-Winkel montiert, kann das Display nicht mehr im vollem Umfange bewegt werden, weil der L-Winkel das Gelenk des Displays überdeckt. Damit ist nicht mehr möglich das Display ganz auszuklappen oder z.B. nach vorne zeigen zu lassen, wenn man sich z.B. für Youtube Videos selbst filmt. This doesn’t bother me that much because as i mentioned i don’t use the Canon 6D MK II for video, but it is a restriction while capturing images. The above image shows the maximum angel of the display with the mount bracket. And finally i hoped that the Mengs MPU-100 L-Bracket would fit to my Lumix G81 because i’m searching for a longer time. But the bracket is a little bit to big for the camera so that the upper end of the bracket conflicts with the connection for the camera strap. And even worse the tripod mount on Lumix G81 is placed very much too the front of the camera, so the bracket won’t fit at all. But this time i’ll keep the L-Bracket and i think i can use it since i can leave with the restrictions in practical use. Need new Lightroom Mobile and Premiere Clip?